19 years ago we found this amazing baobab tree in an open cast mine in Hwange area, so we agreed to bring it to Victoria Falls. It was 18 meters tall and needed a low-loader to transport it the over 100km all the way to Victoria Falls. It was a mammoth task and we encountered various problems trying to transport this big tree over such a long distance. About half way along, we hit a power line, electrocuting the baobab and singeing two meters off the top. In another twist of bad luck we got badly stuck on the Masuwe bridge coming into the Falls, holding up dignitaries from flights for three hours! She was a mission to replant but because there is no tap route, so the transplant was possible. Thankfully, it survived the electrocution and is now thriving as you can see. Sadly we have recently had to lop off a main arterial branch as she was lop sided and starting to tilt. 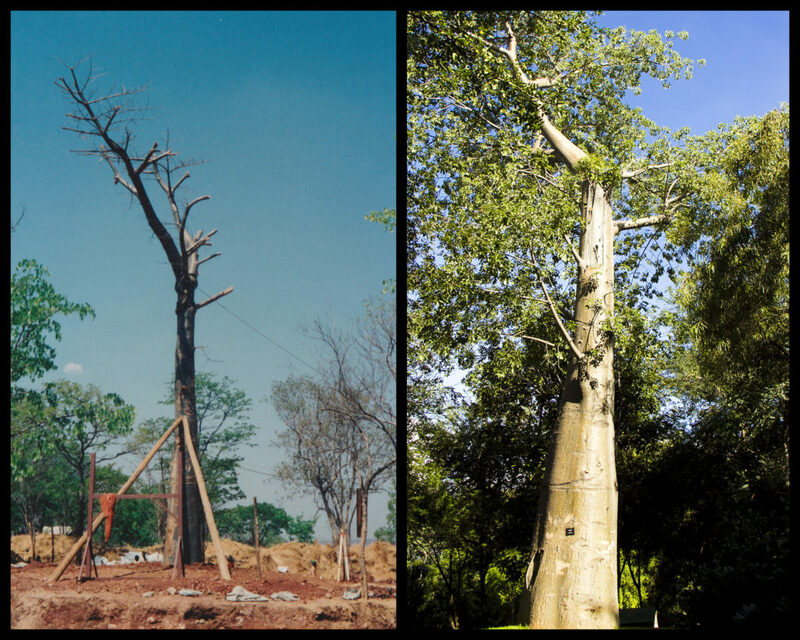 A full 19 years later she is a wonderful feature outside the lodge, still growing straight and tall, providing food for birds and monkeys and shade for our guest as they marvel at this wonderful baobab tree.